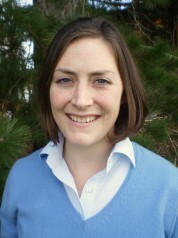 Laura Christianson from Ames, Iowa was a 2010 Fulbright US Graduate Student at Massey University in Palmerston North, where she researched the use of woodchip bioreactors for nitrate removal from agricultural drainage waters. Shortly before returning to the US, Laura reflected on the sights and sounds of her year of agricultural research in New Zealand. The “squeech” of stepping in a cow pat or the “zing” of brushing an electrified fence were two noises that quietly added excitement to my Fulbright research. 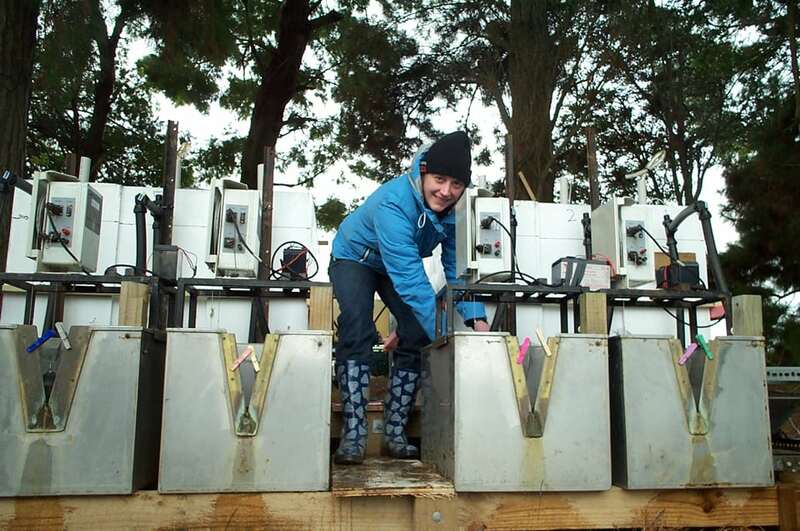 For me, the winter of 2010 conjures memories of navigating Massey University’s dairy pastures to collect water samples from my denitrification bioreactors, a new treatment to remove nitrate pollution from New Zealand’s agricultural drainage waters. This project was built upon other work I’m doing for my PhD where I’m investigating these bioreactors for treating nitrate in agricultural drainage from cropped fields in the US Midwest. My colleagues in the Soil and Earth Sciences group at Massey were ideal hosts; their interest in and support of my project far exceeded what I could have hoped for… and their advice about the electric fences was well heeded! I expected my Fulbright studies to contribute a unique “international dimension” chapter to my dissertation, but I am extremely pleased that this work also facilitated several additional collaborations where I gathered new ideas and learned different techniques. Though my research mainly involves agricultural waters, the complexity of the nitrogen cycle means that sometimes when nitrate is removed from water, the nitrogen can reappear in the air as nitrous oxide, a potent greenhouse gas. Greenhouse gas research work is especially important in New Zealand as the per capita agricultural greenhouse gas emission is considered high among developed countries. The internationally recognized expertise in agricultural greenhouse gases conveniently located in Palmerston North was perfect for my collaborations in this field. Gas sampling from the surface of my denitrification bioreactors was a new experience for me; I found it slightly bewildering to collect a gas sample and have the sample container still look empty. In addition to the “squeech” and “zing” of my field studies, gas sampling added the (frustrating) excitement of “psssft” – the sound of a meticulously evacuated gas sample vial being accidentally vented to the air! I plan to finish my PhD in December 2011, after which I’m leaving the door open to other noisily exciting professional opportunities. On a more personal note, when my husband, Reid, and I first arrived in late January, we had a short conversation that consisted of: “What are all those white rocks? Oh, sheep.” I reluctantly admit that we have four agricultural engineering degrees between us… Fortunately, Reid had some hands-on experience with the Kiwi sheep industry by “farm-sitting” at my department head’s farm while my research group attended a soil science conference in Brisbane. Reid wasn’t too worried about the arrangement until he realized it was lambing season. In the end, only one sheep didn’t make it though the week (natural causes, I’m sure), and when all was said and done, the farm had a handful of more baby “white rocks” running around. Our professional interests in agriculture led to an interesting perspective on our sightseeing around the country. Though we like to use the engineering term of high beauty “density” to describe the wilds of the country, the agricultural sector is never far from the eye. From center pivot irrigators in the Canterbury Plain to delicious looking horticulture in Hawkes Bay, it seems this industry is a source of pride for many Kiwis. This culture strikes an interesting balance with the desire to conserve and protect natural resources, which is also close to many Kiwis’ hearts. I heard a lot of controversy about the slogan “100% Pure New Zealand”. New Zealand has an interesting challenge ahead: to sustainably balance the economic and cultural value of agricultural production with the intrinsic value and “purity” of its natural resources. I look forward to tuning in to New Zealand’s discussions of this while watching for similarities and differences with the US in agricultural policies, regulations, and public opinion. When not traveling the fabulous New Zealand countryside, we found we fit in perfectly with our home city, Palmerston North. The fact we fit in so well was a bit dismaying when we learned that the city doesn’t have a reputation for being, well, the most exciting place in the world. Nevertheless, whether we were enjoying the student culture at the uni or going for a run along “one of the ten most polluted rivers in the western world” (we’re still looking into that), Palmy provided an ideal backdrop for this quiet American couple. At home in Palmy, it was fabulous to play violin with the Manawatu Symphonia. Being able to borrow a several thousand dollar violin, free of charge, would only happen in New Zealand. The Symphonia has provided a learning experience in addition to my research; who would have guessed a “crotchet” was a quarter note? !